Did you ever notice, the attitudes around you are infectious? If you find a group of friends who are in love with what they do, that radiates and enraptures you, and soon it is your new love. That is how I feel about the Quilt Shop I found when we moved from Ohio to Franklin, TN. Our move to Franklin was very sudden. We had been in Ohio for 6 years, our whole married life, moving there from our home state of Pennsylvania after we finished graduate school. Both our daughters were born in Ohio, all my friends were there, it seemed I was leaving everything behind, which was hard for me. On our way down for the final move, we stopped at the Tennessee welcome center just over the Kentucky border on 65. 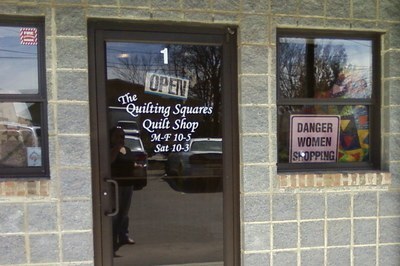 There I found a flyer advertising The Quilting Squares Quilt Shop in Franklin. I thought it was odd that a shop would advertise at a rest stop, but since we were moving there I grabbed the flyer. Maybe it was an omen. The front of the shop, I loved the Danger Women Shopping sign. I kept the flyer on the fridge for the first month, and when I was about to throw it away, I instead took it to the computer and checked the online calendar. I saw there were classes, and more importantly, an open sew night two Friday nights a month. I called, figuring my husband could watch the girls and I could finally meet local people who loved to sew, even if I had only had one quilt class in Ohio and only knew the basics. I remember the first "Poker Night". I didn’t know what to expect. I grabbed my machine and the project I was working on and went. It was wonderful. I know now that if I had never met the squares, I wouldn’t have become as obsessed with quilting as I am now. I met women from all over, as far away as Murfreesboro, who were drawn to the shop for the same reason I was, the people. Sure, the shop had a great fabric selection, and a sale area which includes a $1 fat quarter bin, but the ladies make the shop. The owners are two best friends, Kathy, an amazing machine quilter originally from central New York, and Kay, a former Home Economics teacher, who still has the "teacher voice". Both ladies are great teachers and resources. Poker Night was amazing, we sat, talked, ate, and sewed. Some of the ladies at PMS night. Penny Archer is laying out a design for us to look at on the design wall. After that, for my whole time in Franklin, I never missed a Poker Night, or PMS night, as the open sews are called. I was also able to take a few classes, which greatly helped me improve my sewing and quilting skills. My first friends in Franklin were my quilt shop friends. Their love of the craft inspired me. I loved having ladies to bounce ideas off of. Everyone had their area of expertise. I learned more from those nights than a year’s worth of classes. My stones of Franklin quilt, based off of the plantation in Franklin from Bonnie Blue quilts. I made it to always remember my time in Franklin. 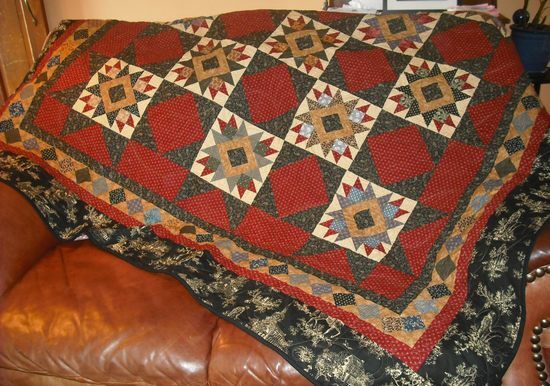 When I first moved to Franklin, all I had ever really done was sew big squares together to make simple quilts. I would have never thought I could do something like this pattern! Sadly, last May after only 2 years in Franklin we moved again, this time to Northern Mississippi. I am only 3 hours from the shop, and have been able to visit. I found from traveling around that shops like that are few and far between. Luckily I was able to join the local quilt guild, because their meetings are when my youngest is in preschool, and the ladies are just as wonderful. I still miss the shop though. It is not only our love of our craft, but our love for our friends that can help us grow in quilting. Pannay Guigley is a quilter and bag lady currently living in Northern Mississippi where she tries, sometimes successfully, sometimes not, to balance raising her children, running a household, and spending time at the sewing machine. 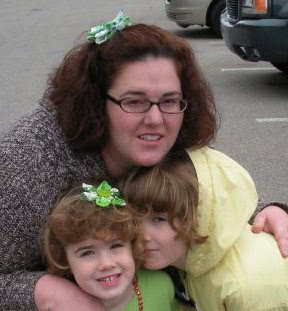 Her blog is about sewing, quilting, cooking and parenting. Thank you Pannay for the kind words. We try very hard to make the shop a great place to enjoy, shop and visit! That was a lovely post to read, Pannay. 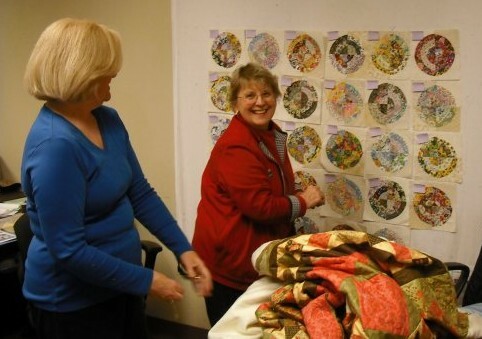 I am sure you will be able to find more kind quilters out there soon as there are many. Sounds like you have had a wonderful start to your quilting experience with a long way to go, enjoy it. .-= DianeH’s latest post: Good Things… =-.